A unique campus with university buildings and residence halls. The beautiful historical city directly on the Saale river. Parks full of shrub gardens and other plants can be found everywhere. 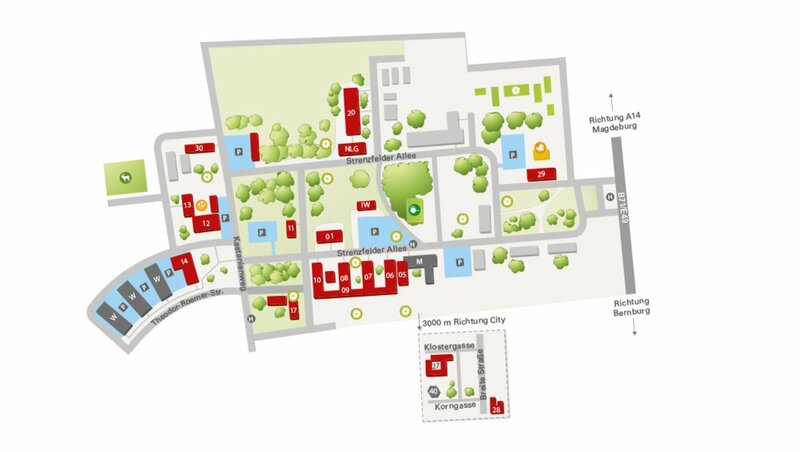 The Bernburg-Strenzfeld campus stands out with a high quality of life and studies. The departments of Agriculture, Ecotrophology and Landscape Development (Dept. 1) and Economics (Dept. 2) are located here. Well-equipped sports facilities and attractive leisure time activities offer the perfect way to relieve stress. 53 professors supervise around 3,000 students. Agriculture, Ecotrophology, and Landscape Development is the largest department at Anhalt University. The dominant color in the background may be blue, but they are still green. The Economics department is characterized not only by its content but also by the great student life on campus.